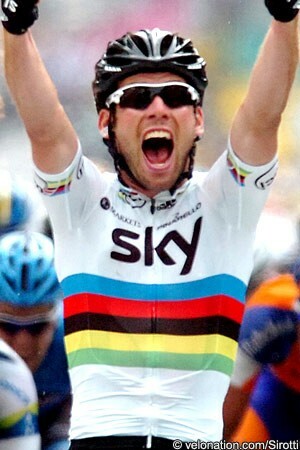 Having said the day before that he had no intention of exchanging his precious rainbow jersey for gold, Mark Cavendish (Team Sky) did so after the fourth stage of the 2012 Tour of Britain, as he sprinted to his second straight victory. The World champion won another untidy sprint on Blackpool’s Golden Mile after his Sky team had shattered the peloton in the final 25km; he allowed lead out man Luke Rowe to drift off the front - as he had done on stage two - but this time was able to come around race leader Leigh Howard (Orica-GreenEdge) to take the stage. A ten-second time bonus on the line for Cavendish saw him take over the race’s gold jersey from Howard, who could only manage third, as compatriot Steele Von Hoff (Garmin-Sharp) came past him on the line. “Bradley [Wiggins] lives not far from Blackpool and the route included a lot of the roads he uses for training,” explained Cavendish after the finish. “He told us it was very open, and very windy, and he knew the exact place we should go on the attack. It was the perfect call. “It was a grim day but we ploughed through and waited until that moment 22km from home to split things apart, and although it was difficult to do that with a small team, the fact Endura were riding as well made it easier. “On those last 5km along the front we just made it so fast that nobody else could get close to us. “We’d expected a crosswind, but in the end it felt like a tailwind, and we were flying," the World champion added. "Luke’s going for the overall so we tried to let him get a bit of a gap like the other day, but then Leigh Howard jumped so I had to go with him, and then it was quite straightforward for me in the sprint." The 156km stage between Carlisle and Blackpool saw the peloton race under heavy rain as it crossed the Lake District, but it was the wind on the flatter final section that allowed Team Sky to blow the peloton apart. The break of the day came from mountains leader Kristian House (Rapha Condor), Ronan McLaughlin (AN Post-Sean Kelly), Niklas Gustavsson (UK Youth), Dan Craven (IG-Sigma Sport), Mathew Cronshaw (Node4-Giordana) and David Lelay (Saur-Sojasun). The six riders escaped in the opening kilometres, and managed to open a maximum lead of almost seven minutes before they reached the first hills of the stage. With the peloton closing in the group was reduced to four with 40km to go, as House and Gustavsson were left behind, then down to two in the final 15km as a McLaughlan attack pulled Craven clear, but were caught by the peloton with just under ten to go. The crosswinds of the final 25km had seen Team Sky go on the offensive however, and the group that eventually caught the breakaway riders was less than 30 riders strong. Team Sky and Endura Racing continued to keep the pace high into Blackpool and, despite Cavendish allowing Howard to overtake him in the finishing straight, cruised past him at the finish to take the win. House, McLaughlin, Gustavsson, Craven, Cronshaw and Lelay jumped away in the opening kilometres and were 6’50 clear by the time they had ridden 30km. This was as far as they were to get however and, as Gustavsson led over the first intermediate sprint in Shap after 43km, and House led over the 2nd category climb of Shap Fell after 51.8km, the gap closed to six minutes where it was allowed to remain. Gustavsson was by far the best placed of the six riders, just 17 seconds down on Howard at the start of the day and, as he picked up bonus seconds, he was getting closer. The peloton was led by race leader Howard’s Orica-GreenEdge team, as Cronshaw took the second sprint in Kendall after 66.7km, and House led over the 2nd category Old Hutton climb after 79.9km, but then Team Sky came forward and steadily slashed the gap to 3’20” at the 100km point. The sextet’s lead continued to fall, and was below two minutes with 50km to go as Endura Racing joined the chase. The heavy rain had left large puddles though, and areas of standing water right across the road in places, which slowed the peloton’s progress a little. Cronshaw took the third sprint, in Caton after 106.4km, then House rolled over the top of the 3rd category climb of Quernmore with 42km to go. Shortly after the group descended the other side Cronshaw attacked and McLaughlin, Craven and Lelaywent with him. Gustavsson and House were left behind and steadily drifted back to the chasing peloton. The new impetus in the break saw its lead begin to rise and, with Gustavsson back in the fold, the immediate danger to Howard’s lead had passed and it reached 2’20”with 30km to go. As the peloton hit the exposed roads with 25km to go though, Team Sky, Orica-GreenEdge and NetApp lifted the pace and began to split the peloton into pieces. With 22km to go the gap to the leaders had been slashed to less than 1’30”, but the yellow jersey group was now less than 30 riders. The entire Sky team was present, along with most of Endura Racing, Orica-GreenEdge, as well as some from UnitedHealthcare and UK Youth. Inside the final 15km the four leaders were just 32 seconds ahead, and were in sight of the yellow jersey group - which was led by Team Sky’s Bradley Wiggins - on some of the straighter roads. Two kilometres later - when the gap was just 20 seconds - McLaughlin attacked and was alone as he crossed the exposed Wyre river bridge. Craven fought his way across to the Irishman as Lelay and Cronshaw were caught and passed by the bunch behind them. At the ten kilometres to go banner though, the two leaders were just eight seconds clear and they shook hands and sat up. Having caught the break Team Sky and Endura Racing kept the pressure on, and the speed high, as the remains of the peloton entered the outskirts of Blackpool. The second part of the main field was now almost a minute and a half behind, and had virtually no chance of closing the gap. Four kilometres from the line McLaughlin tried to jump away again, but Team Sky was having none of it and calmly closed him down within a few hundred metres. Christian Knees led the bunch onto the Golden Mile with two Endura Racing riders on his wheel, Wiggins took the line across the road however, with Rowe and Cavendish on his wheel as they entered the final kilometre. Cavendish allowed Rowe to detach from the front of the line with just a few hundred metres to go, and Howard came around as he had done on stage two. This time the World champion had got it right though, and cruised past him with 50 metres to go. Ten seconds on the line saw Cavendish take the gold jersey from Howard, even though he has said that he wanted to avoid it and keep his rainbow jersey on for as long as possible.